Iphone 6 Plus vs Nexus 6 comparison:Â The change to the Nexus line came as a big surprise to many, not only in terms of the jump in size, but also with regards to its more premium design, and matching price tag. On the other hand, it was an inevitable move on the part of Apple to finally introduce a larger form factor with their flagship iPhone, with the two versions available bringing the fight.Lets have a comparable look below in detailsÂ Iphone 6 Plus vs Nexus 6 comparison,Â Â specifications, price, comparison and pros and cons. 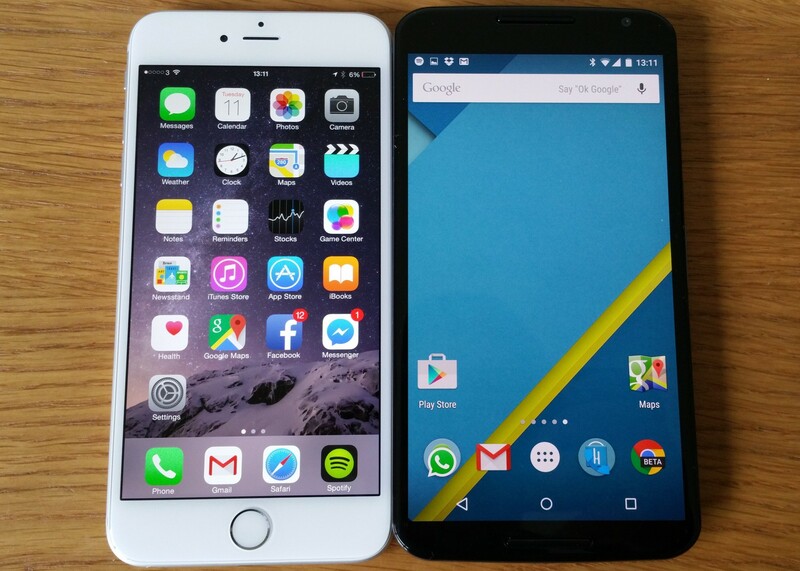 The Nexus 6 isÂ dramatically larger than the Nexus 5, and in the case of the iPhone 6 Plus, the jump isÂ even more impressive when compared to the much smallerÂ iPhone 5 family.The iPhone 6 introduced a rounded look to its design language, with the larger Plus edition an identical counterpart, only with a screen bumped up to 5.5-inches. The result, as always, is an attractive phone featuring Appleâ€™s typical design cues, onlyÂ made a little bit harder to handle because of its size. In the case of the Nexus 6, Motorolaâ€™s design language takes center stage here, as the phone looks like a large Moto X (2014).Â No buttons on the front mean that the inputs are made with software keys. One of the big concerns with the Nexus 6 was in terms of the handling, but theÂ curve on the back does help with the phoneâ€™s feel in the hand.Â A metallic frame also helps the Nexus 6, adding to what is one of the most exquisite Nexus devices yet. Appleâ€™s display technology gets a bump up to 5.5-inches and offers Full HD resolution,Â whichÂ results in in a pixel density of 401 ppi. An IPS construction makes this screen pretty easy to view in daylight, and text is easier to view on this larger display, compared to previous smaller iterations of the iPhone. Talking about performance in a comparison like this is always a bit of an odd situation, because what weâ€™re pitting against each other are two completely different architectures, catering to equally different ecosystems. Under the hood, the Nexus 6 packs a quad-core Qualcomm Snapdragon 805 processor, clocked at 2.7 GHz, backed by the Adreno 420 GPU, and 3 GB of RAM. The device boasts the kind of high-performance processing package youâ€™d expect to find with a flagship Nexus smartphone, and can handle anything you throw at it with ease. Opening, closing, and switching between applications is a Â breeze, and gaming is also extremely smooth and enjoyable.Â While I might have seen a few hiccups here and there, it has more to do with theÂ occasionalÂ bug in Android 5.0 Lollipop, whichÂ are sure to be fixed in updated versions. Apple likes to put together their own processing packages, and any iOS user can tell you that their architecture works well for their needs.Â The A8 is the processor of choice for the iPhone 6 Plus, and its dual-core 1.4GHz Cyclone chip is backed by quad-core graphics in the PowerVR GX6450.Â iOS has gradually become more about flashiness in its interface, but overall, the simplicity of the operating system can be felt.Â Moving among applications is pretty seamless, and even the 1 GB of RAM is able to keep a good number of apps running simultaneously. While the iPhone has a pedigree with good performing cameras, things have been a bit uneven in the case of the Nexus line.The app on the iPhone 6 Plus is about as simple as you can get. Swiping on the viewfinder changes the various modes, and the different options for your pictures are accessed via buttons on the side. iOS was a pioneer in app development, getting many now-essential applications far before Android did, but now, Android has matured, and even with a few niche holes here and there, the difference has become mostly negligible.The HTC M9Â features Android 5.0 lollipopÂ and Sense 5.5. The Nexus 6Â also features the sameÂ Android 5.0Â lollipop but with the capability of upgradation to the latest android.So,both the smartphones boosts up with the same operating system. The Iphone 6 Plus Â features a 2915 mAh battery, which could last up to two days with 2G services. However Iphone has added aggressive power saver options to make sure your device lasts the distance and it’s very impressive. The Nexus 6Â features a 3200 mAh battery that will get you through the day. It also offers power saving features to match those of NoteÂ series phones. Both devices are a step above the previous generation, giving much better endurance. So Nexus 6Â has better battery capacity as compare to the Iphone 6 Plus. They are certainly the best that both of these systems have to offer, both in their own big way. Those who are already loyal to either ecosystem will make their obvious choices here, but for everyone else, the matter comes down to what you want out of your phone. Media consumption with front-facing speakers and a gorgeously powerful screen make the Nexus 6 a pretty compelling choice, but the iPhone 6 Plus has a pretty tried and true design language, that has been thrust into the now of smartphone trends. The iPhone 6 Plus and the Nexus 6 are the premium editions of their respective lines, and come with price tags that fit that notion. The iPhone 6 Plus can be found on all networks at a reduced on-contract rate, or for the full unlocked price of around $800 for the base 16 GB edition. The Nexus 6, on the other hand, can be found on most of the networks on-contract, or comes with the unlocked price of $649, putting it in a more affordable space for those who donâ€™t want to be tethered to their cellular plans.